It is possible that there may be a hidden Bluetooth chip inside the new Kindle Oasis. The Kindle Oasis is Amazon’s 8th generation Kindle that was released on the 27th of April 2016. This ereader has a totally new design compared to its predecessors. It has a thicker part in the body referred to as hand-grip. It has page flip buttons – both on the side of the hand-grip. It has two batteries instead of just one – the first one is inside the handgrip, and the second one is inside the protective leather cover. Is there hidden Bluetooth on the Kindle Oasis? Now there is also a speculation that the Kindle Oasis may have Bluetooth connectivity hidden in its features. This rumor is based on the model number of the Kindle Oasis devices – the same number was published in one of recent FCC reports when a certain device was tested. FCC (Federal Communications Commission) is an independent agency that regulates communications by radio, TV, wire, satellite, and cable in the United States. 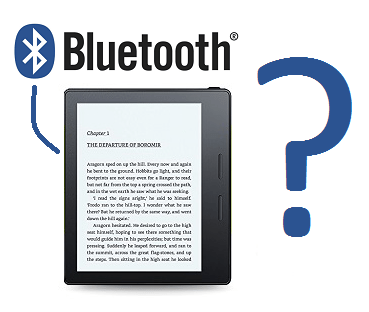 If the Bluetooth capability is available in the Kindle Oasis, it has not been made public. Maybe this feature is not functioning in the present Kinder Oasis, but may become part of the future Kindles? So, Is the Kindle Oasis Bluetooth capable? The FCC report didn’t mention the Kindle Oasis or any other device directly, but the model numbers of the new classy ereader and the FCC filings are identical. The Federal Communications Commission tested the device with Wi-Fi and Bluetooth, including a Bluetooth earphone. This would indicate that the Oasis may be set up for audio support. The question is: If the Kindle Oasis is Bluetooth compatible, why did Amazon not mention it in their press blurb? Wouldn’t it justify the price tag even more? What are your thoughts on this latest Amazon Kindle Bluetooth conspiracy? Bluetooth is a wireless technology that allows to exchange data in a short distance range between fixed and mobile devices. Thus it replaces cables that would otherwise need to be used to connect different types of devices, from phones and headsets to medical equipment. This technology was invented in 1994 by a group of engineers at Ericsson. In 1998 Ericsson, Intel, Nokia, Toshiba and IBM formed the Bluetooth Special Interest Group. The range of the popular class 2 Bluetooth devices is about 10 meters (32 feet).